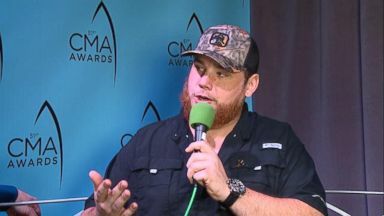 ABC News' "Nightline" went backstage and on the road with the singer, who said country music wasn't always on his radar. media. ABC's adrienn baert sat dn th him for a sowriting sessio order: In E rolling hill ofvirginia thousands have come to etefair Ah! Of country music's newest Bret stars, LE comb ??? I've ??? songs are GE sure Ian sing evenight. ?????? Thesold-out crowd knows eve word O leased song R never brokheart. Firs shared by a fan onl media. Lonece C beer N broke my heart ??? Thanks for coming, guys. And Luke isbout relating to his fans, sporting ar hat andhing shirt at every show It's about how cool my clothes are O howeople think I am. S really theve spent their hard-earn money. A lot ofhose folks W have lot of ne a lot of country music ther re met up with him at the Mercury lounge, where played his first New York City to country fame dropping back-to-back number one hits. "When it rains it pours." ??? Oh, lo, when it rains pours ??? and I hit me like rricane leanin Y audice, or foowers, as a focus gr Theres nothing wit fans. D taken the songs and put them out when ite them and P a little out T do youhi about this or what do you think a th. A hurricane ??? re TD thatit on ybe in 2015 Howou feel when "Hurcane" her one? It was awesome. To happen I think. It man, I Reay D want this to stop. ??? 17 don't tnk that much ??? ??? you'reiving ??? Rorter: Country music was not originally pepl. His songest of me" ctu hisrise. ??? She got the B of me ?? ?wing up we were super lass. I ale I had everything ieeded but N ev wa I'd never been on anplane ias. Reporter: He didn't even pick up the guitar until he was 21. I an, I didn't really lien to music at all. Hei oollege iot introduced to a guy named Eric church when I pkep the guitar I was like man, if that S from here I tnk I can do it. 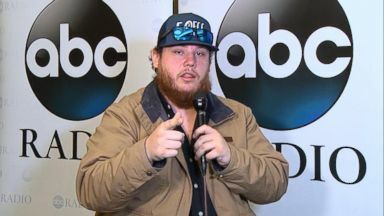 Reporter: Ithere was sounra to Luke combs, singinhouse, singing around the shower. Vince gill. All N 1990 we singing was backstre Bo 'N sync sfwlp wait a nute,uk comwas singing backstreet Bo N line? If you'reatching th T and Yo trying T me you didn't listen to backet you're lying. Can you give a line What if I full sync? I would love th ??? god mus he spent a lit more onou ??? right. Yeah. Look atthatt''m talking about. Repter: Back on the road in west virg. Whatf you do it seems like yesterday left. Reporter: We sat in on a tour bus songwriting ion. Feels likeyesterday. When it comes songiting I'm super, perfectionist. The small he should this be a but or an and or an or. Like that stuff is super important. I think that's WHA mostfkind of th camaderie. You'rebeautiful, crazy ??? His songs are personal. "Beautifulbout his girlnd nicolehog, hit number on iTunes across all genr hat got me some serious brownie ints.asefore were cially data. That sealed the deal I think so.I so. Reporter: It's an hour owtime and gng the zone. Beverage. Always important. Is like to throw a hat ke to the crowd, you know. W going black jeans, which requires black boots a B ha unning low on th hats. So today we're get NASCAR country, music from that . Th's P areing toght. Aot of stuff on . ?????? hade bar lukeanach pce to feel fires Just be on the swivelight Abt if io something weird don't be L what's he doing. Ch . If I go out, someone's arthing. Yo what mean? One,two, th ??? oh got the ??? ??? we're gonwhiskey S till:00 A.M. And I'll do another show Repter:s Luke's a newyo's Madison squa garden opening for Jason alde's highooneon . Exhilarating a emotional. Just last he was Oge WATC aldea perfo in Las Vegas when shots rang out. You know, one of tho things Y don't love to reli bit. H as you'd like to forget, it you dt those P be fgotten either. It makes you appci Y do wle lot more. Because all cou bego espeally that night itould out re being ae T do this. And sing nge PEOP's lis in a positive way. I've beening to see him forever this is the first time he's he. 300 milesus to seems. Wow. Just to see himsing. He has T old feeling. Enjoy it. Itunt. Reporter: With hiso-to andiet in Han Luke takes the stage. Every man'ountry ar. And ase says, giv fans want. ?????? while your drm, have Yo thoughtf a next dream? Lik id, I want giv the folks what they deserve. Kn T they deserve my St. And I nt to GE tm my best. And I want Toake sure they it. Sitting at home all alone trying T fall as??? Reporter: For "Nightlin I'm ai aid adrienneankert in W York. Combs talks about what it means to have his family at the CMAs for his best new artist nomination. 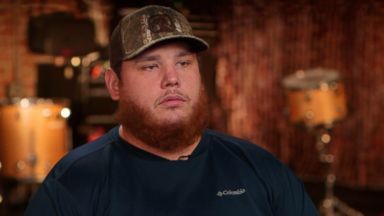 Luke Combs talks about his college days feeling out of place before he picked up a guitar. During a "Nightline" interview, the 28-year-old singer, best known for hits like "Hurricane" and "She Got The Best of Me," shows off his "best JT voice." 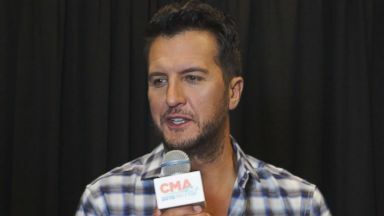 Luke Bryan says how he used to dream about closing out CMA Fest and talks about this year's summer tour.